When making foods like muffins and cornbread or any quick bread, mix the ingredients only until combined and the flour is just incorporated. Overmixing your batter will cause a tough batter and an equally tough finished product. You do not want to develop the flour's gluten (protein). You want what is known as a tender crumb that will be achieved if you just combine ingredients without overmixing. If your quick breads rise unevenly there may be several problems. Make sure you place your quick breads in the center of the oven where there is the most even heating. The bread may also have been baked at the wrong temperature. If your oven is too cool or too hot, purchase a thermometer for inside the oven to check the actual temperature. You may need to have your oven recalibrated. A close, dense textured quick bread indicates the batter was overmixed, the dough was too wet or dry, the oven was too hot, or the bread wasn't baked long enough. Arm & Hammer Baking Soda. Today Arm & Hammer company produces almost all the baking soda that is used in the United States. When baking soda is heated, it slowly breaks down into sodium carbonate, water and those magic leavening bubbles, carbon dioxide. When mixed with something acidic and wet, it starts producing carbon dioxide right away without waiting to be heated. Below we'll explain when to use it and how much to use. The next logical step after developing baking soda (which only worked when there was something acidic in a batter) was to create a "combination" powder which just needed to get wet to become active. To do this, baking soda was combined with a powdered acid along with a little cornstarch to keep the two dry and inactive. This second magic powder was "cream of tartar," a fruit acid that accumulates on the inside of wine casks as a wine matures. When baking soda and cream of tartar are moistened in a batter or dough, they begin to react to each other right away producing (you guessed it) lots of carbon dioxide bubbles. This combination powder is still a very effective leaven although it has a couple of drawbacks. As its name indicates, it is "single acting." When it's mixed into a batter or dough, it starts and finishes its reaction then and there. When you bake with it, you must get whatever you're making into a preheated oven as quickly as possible before the bubbles begin to disappear. The second drawback is that, no matter how dry these combination powders are kept, they lose their potency after awhile. In spite of these limitations, there are people who still prefer the flavor of this old blend and value the fact that it is composed entirely of naturally occurring ingredients. This is the leavening agent that most recipes are written for unless something else is specified. Double acting baking powder is single acting backing powder taken one step further. The baking soda is still there but the cream of tartar has been replaced by two acids, one like cream of tartar that reacts to the baking soda as soon as it's wet, the other that doesn't begin to react until it's heated. This means you can be more leisurely about getting a dough or batter into the oven. Like single acting baking power, double acting backing powder contains a little cornstarch to prevent the soda and acids from reacting. And it too will lose its leavening ability after a while. If you want to see if it still has its "get-up-and-go," put a little in a cup of hot water. It should start fizzing and bubbling right away. The acid you find most frequently in double acting baking powder are calcium acid phosphate and sodium aluminum sulfate. Both of these substances are considered by the Food & Drug Administration to be "GRAS," or "generally regarded as safe." There have been some reports recently about potential neurological problems associated with aluminum. There are so many sources for aluminum around us that baking powder is probably a minimal one. If it is of concern to you, choose a powder that doesn't contain aluminum or use the old baking soda/cream of tartar standby. Since baking powder does tend to lose its leavening powder after a while, rather than being caught empty handed, it's useful to have baking soda and cream of tartar around in separate containers. Then you can make your own baking powder in an emergency. These are both available separately at your grocery and, separated, have an indefinite shelf life. To make the equivalent of 1 teaspoon of double acting baking powder, mix 1/2 teaspoon of cream of tartar with 1/4 teaspoon baking soda (two parts of cream of tartar to one of baking soda). This single acting backing powder will work very successfully but you must remember that when you use it, get whatever you're baking into the oven right away. First, acquaint yourself with a quick bread's structural ingredients (the things that hold it up) and then its "decorative" ingredients (the things that weigh it down). Raisins, Nuts, Chocolate Chips, Cheese, Diced Fruit, Etc. In a quick bread (or any other baked good), structural ingredients form the skeleton and help it keep its shape. Decorative ingredients give it its personality but weigh it down. 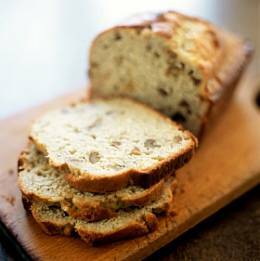 If a quick bread doesn't contain any decorative ingredients, it won't need much leavening power to lift or expand it. (You don't need much strength to walk around in summer clothes, but you do need lots of muscle to wear a suit of armor.) A quick bread that has lots of decorations or "optional extras" needs extra muscle or lifting power too. First count the cups of flour your recipe calls for. You want to include at least 1 teaspoon of baking powder per cup. If your recipe contains a cup or more of decorative ingredients, add another 1/2 teaspoon of baking powder per cup of flour. FOR EXAMPLE: Let's say your recipe calls for 3 cups of flour and 1 cup of raisins. First you'll need 1 teaspoon of baking powder for each cup of flour. That makes 3 teaspoons. To help lift those raisins, you'll want an extra 1/2 teaspoon of baking powder per cup of flour. This makes 1 1/2 teaspoons or 4 1/2 teaspoons of baking powder altogether. Baking soda is used generally when there is an ingredient in a batter that is particularly acidic, such as buttermilk or molasses, anything that can take the place of the acid in the baking powder. FOR Example: If our recipe contains 3 cups of flour plus 1 cup of raisins and we want to use 1 cup of sweet milk, we blend 4 1/2 teaspoons of baking powder into the flour. If we want to substitute 1 cup of buttermilk for the sweet milk, we'll blend 1/2 teaspoon of baking soda into the flour and use only 2 1/2 teaspoons of baking powder. In other words, 1/2 teaspoon of baking soda plus 1 cup of buttermilk (or an equivalent) can replace about 2 teaspoons of baking powder. Here are some other ingredients that will react with 1/2 teaspoon of baking soda and can replace 2 teaspoons of baking powder. This list is by no means complete but it may give you a sense of what ingredients can be used. There is no situation where you must use baking soda, even when you have an acidic ingredient in your dough or batter. Because baking powder contains both baking soda and an acid, it will create carbon dioxide bubbles even when there's extra acid present, such as the buttermilk. You can choose to use baking powder completely, If you do, the flavor of the acidic ingredient (buttermilk, etc.) will be slightly more pronounced since there is no baking soda to react with or neutralize it. The texture will also be a bit finer than the coarse or "shaggy" texture that is characteristically caused by the action of baking soda. You may find you like the flavor and texture of things leavened with baking soda or you may prefer baking powder. Try a recipe both ways. Just remember that you can't use baking soda in place of baking powder without something acidic to react to it. Without something to neutralize it, it will leave a bitter, salty taste. And always blend either one thoroughly into your dry ingredients first so it will be evenly distributed throughout the dough or batter. When making foods like muffins and cornbread, or any "quick bread", mix the ingredients only until combined and the flour is just incorporated. Overmixing your batter will cause a tough batter and an equally tough finished product. You do not want to develop the flour's gluten (protein). You want what is known as a tender crumb that will be achieved if you just combine ingredients without overmixing. A close, dense textured quick bread indicates the batter was overmixed, the dough was too wet or dry, the oven was too hot, or the bread wasn?t baked long enough. 1/2 cup cocoa (not Dutch cocoa, which has been "de-acidified".